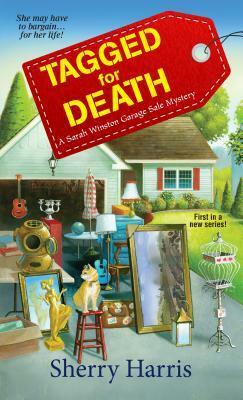 Sherry Harris, Air Force spouse-turned-cozy mystery author, kicks off her debut series with Sarah Winston, a recently divorced military spouse who finds solace in a bargain. Yard sale, Craig's List, or thrift shop, there's nothing like a good deal to soothe over the emotional baggage of watching her 19 years of marriage tossed out like stained clothes. Sarah may have changed her name, and moved off base to the fictional town of Effington, MA, but the wounds are still deep. She indulges in Angelo's bianca pizza and Boston's fluffernutter sandwich. Sarah also helps friends organize their own yard sales and donating leftovers to the base thrift shop. Yet no good deed goes unpunished. While sorting through a donation bag, she finds incriminating evidence that her ex-husband (and Effington's Chief of Police) may have harmed the young airman (actually, young woman) who broke up their marriage. Despite the animosity she feels for her cheating husband, she cannot believe he would harm anyone, let alone the temptress who is now carrying his child. Sarah confronts CJ with the bloodied shirt, only to find herself in the middle of a mystery wrapped in an enigma. 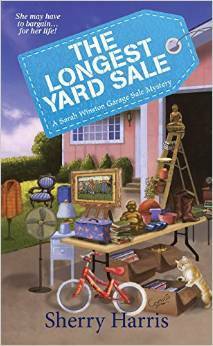 Harris delivers a cozy mystery which is both humorous and heartwarming. The zany characters reminded me of people I've met through my military travels, bringing a smile to my face. Likewise, I emphasized with Sarah's determination to stay sane while other women whisper behind her back. Who hasn't been there, done that? Harris gives readers a glimpse into the rewards and challenges of military life and frequent moves. In fact, she spotlights how much time military spouses give as community volunteers, including the "dirty jobs" of sorting donations at the Thrift Shop (Macklemore would be in heaven). Finally, Harris showcases the charm and quirks of New England from Sarah's perspective as a transplanted Californian. She often shares how New Englanders pronounce seemingly easy words with their unique dialect. TAGGED FOR DEATH offered me a trip down memory lane as I served as a Lieutenant at Hanscom AFB, the inspiration for the fictional Fitch AFB. I remember it as "Happy Hanscom"; Sarah refers to it as "Fabulous Fitch". Indeed, TAGGED FOR DEATH is Ab Fab with Sarah mimicking Edina in her goal to put things right. TAGGED FOR DEATH is an entertaining read with a dash of Colonial cultural and military appreciation. I received a print copy from Sherry Harris as military appreciation. I chose to write an honest review to share the joy I found in TAGGED FOR DEATH. I love a bargain at gently read book stores. 1. What is the most unusual "local" food you have sampled in your travels? As mentioned in the review, Sarah adapts to the Massachusetts's state sandwich, the fluffernutter: peanut butter and marshmallow creme usually served on white bread. When I lived in Boston, I loved New England Clam Chowder aka chowda. 2. Comments are open through Saturday, July 25, 10 pm in Baltimore. 3. I'll post the winner on Sunday, July 26. Check out my interview with Sherry Harris (link) and my review of Book Two in the series, THE LONGEST YARD SALE (link). I'm not sure if it's local or not but I hadn't heard of Ham and String Beans until I moved to Pa. Deep fried cheese curls in Wisconsin! I am not adventurous when it comes to trying new foods. I guess mine would be trying new types of fish, but usually when I travel I stick with food I know I already like. Many years ago I had frog legs in Paris. (I already loved the escargot). We had smoked eel in the Netherlands. The most unusual local food I have tried is deep fried pickles. I was a Peace Corps volunteer, so unusual, at least to americans, local foods were plentiful. One was Jumping Salad. Scoop up small shrimp from the pond, put them on a plate, sprinkle with vinegar, catch them and pop them into your mouth to eat. No cooking needed. I'm not one for trying new foods easily. I tend to stick with things I know & like. We have grinders which are just subs. But there is one where the bread is so crusty it hurts your mouth. in Germany they served what we would consider deli cold cuts for breakfast - fortunately I liked them - needed that protein to start the day! As a rather picky vegetarian, I stick to food I know and love. So I have not tried anything unusual. I think it was in Fla - husband and I had alligator appetizer. I am really not into strange foods, but we ordered it and I took a bite - it was kind of bland tasting. I cannot think of anything; am really not into unusal foods. I tried Paella in Madrid. It had some kind of odd crayfish-type critter in it (whole!). I knew it would have shells and such, but that surprised me! Oh, I also tried a bite of octopus somewhere in Spain and was not pleased with the rubbery chewiness of it!